Now click on Advanced Configuration on the left. Press Security/NAT on the list of options that pops up. Now on the page that loads, look for Security Interfaces. 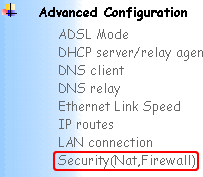 Click Advanced NAT Configuration below the ppp-0 connection. A screen will load, look for Reserved Mappings. In this section press Add Reserved Mapping. Now comes the tricky part. Follow this screenshot and press Add Reserved Mapping when done. You need to do this twice, once for port 4662 TCP and once for port 4672 UDP. Once you have done this simply save your configuration by pressing System on the left hand side menu , then Save config. You have successfully configured your SAR7x5 router to use eMule.